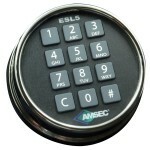 We constantly carry these safes in stock in our Safe Showroom. If you don’t find what you are looking for here please check American Security then call us for the lowest price and quickest delivery time from your safe experts at All Secure! 2″ total wall thickness on all sides featuring our poured DryLightinsulation and two layers of steel for exceptional fire and security protection. ETL Verified fire protection of 1200°F for 120 minutes. Designed to maintain an interior temperature of less than 350°F. Standard built-in internal AC power port with removable external power cord. L. Listed Group II Lock with spy-proof, key-locking dial, massive hard plate and two relocking devices.